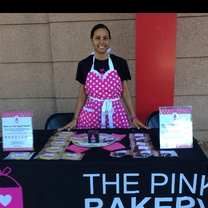 Nubian Simmons and is the owner of The Pink Bakery, Inc (TPB). The Pink Bakery is TN’s 1st Big 8 Allergen Free Bakery. She makes desserts and mixes for people with food allergies to the Big 8 foods (Eggs, Fin-fish, Milk, Peanuts, Shellfish, Soy, Tree Nuts and Wheat). The desserts are made using only Organic, Gluten Free, Non-GMO, Fair-Trade and responsibly sourced ingredients. She created this company because she has food allergies to milk and wheat. Throughout her life, she has been excluded from the “dessert part” of meals and activities. Watching others enjoy something as simple as a piece of cake, knowing she couldn’t eat it without having a severe allergic reaction, was unbearable. After years of this, Nubian decided to learn how to make her own mixes from scratch. She thinks that no one should feel excluded from celebratory moments due to a food allergy. Vanilla Bean cupcakes with Strawberry frosting. "Vanilla Bean cupcakes with Strawberry frosting."